This free ongoing exhibit presents an overview of the life of Frances Perkins, highlighting her accomplishments through historic photographs, text, and personal memorabilia. Panels include: Her Maine Roots and Patriot Ancestry; Mount Holyoke: Her Activist Roots; From Triangle Fire to New Deal; Confronting the Truth: An Unemployment Crisis; America Before the New Deal; The New Deal; Secretary of Labor 1933-45; Social Security: Her Greatest Achievement; and 1945 and Beyond: A Proud Legacy. The exhibit space also includes a small library with Frances Perkins Center publications and related works of interest, some of which may be purchased. 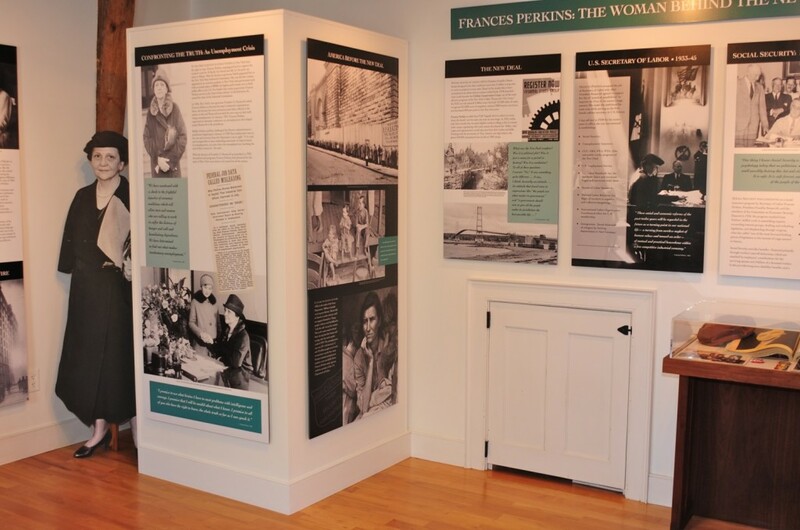 Enhance your understanding of Frances Perkins’ legacy by visiting the exhibit before or after your Perkins Homestead tour. Summer hours are Tuesday through Saturday, 10:00 AM to 2:00 PM, or by appointment. Contact us at info@francesperkinscenter.org or (207) 563-3374 for more information.